A week or two ago I headed out to Solo Performance to try on a few different seats. I wanted something that would drop weight, and add some rigidity and support. SPS has quite the selection of seats, and had an NRG Innovations FRP-310, which is their medium, fixed back seat. I’m 6’4” and weight 250lbs (working on dropping that weight as well), and I actually fit semi-comfortably in this seat. I chose to go with the NRG Innovations FRP-300 instead however, this seat is the Large version of the one that SPS had in the shop. We weighed the seats, along with a mount, on the SPS shipping scale and were shocked at what we found, the scale read what we thought was 9 pounds for the sat and 4 pounds for the mount. 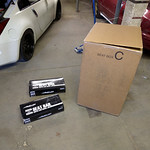 Dave at SPS also ordered me a set of BuddyClub Racing Spec Super Low Seat Rail Kit Nissan 350Z/G35 03-09 to mount the seats into the car. All the parts arrived early last week, so I headed over to the shop on Sunday to work on removing the old seats, and putting in the new ones. It is good to have a friend in the business, while I could have installed the seats in my own garage, having others around while working on the car and watching various other work get done on customer vehicles is motivating. Installation of the seats is fairly straightforward, but it did take me far longer than I expected. The main problem I ran into is that, at 6’4”, I needed to have the seats in the lowest position possible when mounting them (driver’s side all 4 corners on the lowest setting, passenger side 3 of the four, due to a hump in the passenger floorboard at the tunnel). Getting the seats onto the Buddy Club rails at the lowest position, was easy to do when I didn’t tighten everything down, and test fitted the installation, but as soon as I tried to tighten everything down I pretty much had to try it multiple times to get things lined up correctly so that the rails didn’t hit the bottom of the seats, and the holes in the rails lined up with the bolt holes in the floor. Even with all the test fitting I did, after getting them mounted in I find that the sliders are binding up. Fortunately I can mover the driver’s seat enough to make myself confortable, but anyone shorter is going to have troubles, so hopefully I can work out the binding issues down the road. When I got the seats and rails mounted, I decided to weight them, I was shocked at what I found, 11lbs. I then put the stock seats on the scale, and they weighed in at 19lbs. This was going to be a problem, in SCCA Autocross, STU class, you can replace the seats, but if you do, the replacement must weight 25 lbs. What advantage would I have of replacing my 19lb seat, with a 25lb seat, is the “grip” worth the extra 6 pounds. The more I thought about it, the more something had to be wrong with the scale. There’s no way the stock seats only weighed 19 lbs. So off to grab a 25lb plate Dave had around the shop for help in corner weighting and alignment. I threw that on the scale, and boom, 11lbs. Wait, what? Quick check of the scale’s display and we realized that the scale was in kilograms. So how much did they weight? Well, the stock seats weighed in passenger 43.5lbs and driver 44.85 lbs , the NRG FRP-310s with Buddy Club rails, weight in at 24.45lbs (passenger) and 25lbs (driver). To get the passenger seat legal, I stuck 1/2 pound of lead wheel weights on the bottom of the seat. After reviewing the pictures I took, I saw that when I weighed the Passenger Side seat, I didn’t have the slider arm on it, that might have made up for my weight difference. How do they fit? Well, they fit the driver great, while they aren’t all that comfortable for ingress/egress of the vehicle, when sitting in them they are amazing, I don’t plan to do long road trips in them (hello trailer, soon) I think I could drive to/from Kansas City for an autocross in relative comfort. The ONLY problem with the seats, the large (didn’t test the medium size) is a little too wide up top for the stock door panels on the 350z. The doors press against them when they close, and due to the styrofoam body of the panels, they now have indentions in them from the doors pressing against the seats. I figured I have two options, 1) shave the seats down, removing the cover to file them or 2) leave them as is and not care about the door panels. I’m going with option 2 for now, the car has a specific purpose, and that is to autocross, if I ever get annoyed by the indentions/damage to the panels perhaps I can find panels to replace them. The one thing I didn’t test, is how the seats will do with a helmet on. 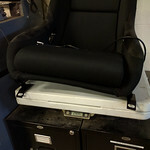 I have a feeling I will likely rub a little bit on the top, but if necessary, I can always pull the padding from the bottom of the seat (and be sure to add weight) to drop down an inch or two in the seat while autocrossing. With times for autocross being fairly short, sitting without padding for those periods shouldn’t be a huge deal. Check out some of the installation photos with close up shots of the various weights of the seats.